BLUE HILL — The first lecture of the Marine Environmental Research Institute’s 2009 Ocean Environment Lecture Series is titled “From Weather to Whales: Connections Between Climate, Plankton, and Right Whales in the Gulf of Maine.” The lecture will be presented by Andrew Pershing on Thursday, Jan. 15, at 7 p.m. at the MERI Center for Marine Studies in Blue Hill. Pershing, a research scientist at the Gulf of Maine Research Institute, will discuss how right whales are affected by changes in plankton abundance. Prior to the lecture, at 6, there will be a wine and cheese reception in honor of the speaker. According to Pershing, conditions in the Gulf of Maine are affected both by local weather conditions and by oceanographic conditions from as far away as the Canadian Arctic. The abundance of key species of plankton has changed over the last 40 years in response to the changes in the physical conditions, and the changes in the plankton community have affected the distribution and abundance of plankton predators such as herring and right whales. “Based on these relationships, we can begin to estimate how the Gulf of Maine ecosystem may respond to future climate change. We can also use this knowledge to develop predictions of where endangered right whales are likely to be found,” says Pershing, who is currently developing computer models to predict where high densities of rice-grain sized crustaceans called copepods will occur and therefore where endangered right whales might feed. Pershing is an assistant professor at the University of Maine’s School of Marine Science and a research scientist at the Gulf of Maine Research Institute. 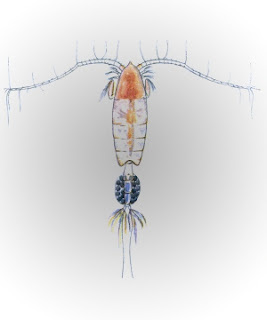 His work has focused on documenting how shifts in the abundance of copepods are related to changes in the currents and water properties of the Gulf of Maine. The Marine Environmental Research Institute, located at 55 Main St. in Blue Hill, is a nonprofit organization dedicated to protecting the marine environment and human health through research and education. Seating for the lecture is limited and is reserved on a first come, first served basis. For information, visit meriresearch.org.